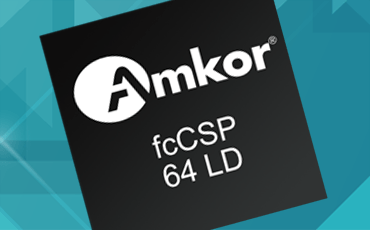 Amkor’s Flip Chip CSP (fcCSP), a flip chip solution in a Chip Scale Package (CSP) format. The advantages of flip chip interconnect are multiple: it provides enhanced electrical performance over standard wirebond technology, allows for a smaller form factor due to increased routing density, and eliminates wire-bond loops. fcCSP is based on Amkor’s proprietary ChipArray® BGA (CABGA) package construction, using cutting-edge thin core laminate substrates. The package is assembled in strip format, in either bare die or overmolded format, and saw singulated for manufacturing efficiency and cost minimization. Pattern plating for fine line/spaces, via-in-pad substrate structure, and thin core substrate panel processing allow for increased routing density and enhanced electrical performance, making fcCSP an attractive option for advanced CSP applications where electrical performance is a critical factor. fcCSP package is an attractive option for handheld/portable electronics where, in addition to performance, package size is critical. Some applications which have adopted fcCSP are high-performance workstations, servers, data communication products and some emerging applications including RF applications where electrical performance is critical. The elimination of wirebond loops allows for a low inductance connection to the die while the increased routing density enables optimized electrical paths for critical high-frequency signal lines.